What to expect on the day of your move. The big day is here. It's the day you're off to a new beginning. For many, it's a chance to start fresh. If you have done your fair share of planning and preparation, everything should go smoothly for you. likely meet when the crew arrives is the moving foreman. They will already have a list of items to be moved that you provided during your estimate, but it's a good idea to do a walkthrough with them before getting started. During the walkthrough with the foreman and crew, you can point out any items that you think may need some special care and handling. Be sure to set aside and point out any items that you will be moving on your own and not with the movers. 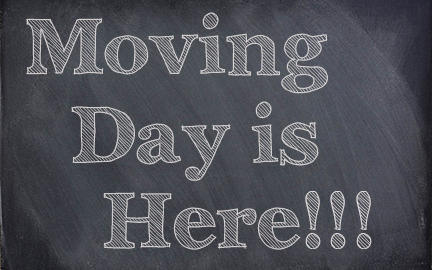 Having everything sorted out before moving day arrives will make the process much smoother for you and the crew. The foreman should note any pre-existing damage along with a detailed description of your goods at the time of loading and should appear on the inventory. This list can be used in case of an insurance damage claim. Make a final inspection before the moving team leaves. Check all those nooks in your attic, basement, etc. Be sure that everything has been loaded and nothing has been left behind. Once ready, review the inventory list with your movers and sign off on the move. It is customary to provide tips to the crew once they have completed a good job. Either hand each crewmember a personal tip, or provide the foreman the group tip in front of the entire crew. Somewhere between $20-$50 per crewmember is standard. If for some reason you cannot be present during your moving day, designate a third party, such as a friend or family member, to help out and make decisions in your absence. Be sure to contact your moving company beforehand to let them know who will be in your place and that they are fully authorized to make the decisions for you. Sit down with your third party so they know exactly what to do up to the smallest detail of your move. This person will be asked to sign documents obligating you to charges and authorizing the movers to move your items. It's a good idea to stay close to your phone on the moving day in case any questions or issues arise.